Feel free to contact us to become more involved by joining a committee or specialty group, attending our events, and more. Our Purpose: Our organization provides the spark and energy every business needs to ignite growth and prosperity through purposeful connections. Our brand promise is to provide effective resources, knowledge and passionate advocacy to local businesses. We work tirelessly for our members to generate dynamic business opportunities unlike those found anywhere in the city. Our Culture: Our culture is fueled by providing innovative solutions to the diverse range of businesses we serve. We are thought leaders. We are passionate and authentic. We are collaborators. We are fire starters looking to ignite economic growth for every one of our members. : We are a community of business owners stimulated by providing explosive business growth opportunities forged from diversity, collaboration and authentic human interaction. We champion the success of our members with dignity and support one another with pride. Passionate integrity is fused into the very core of our community where hard work, inclusion and meaningful relationships define our past, present and future. 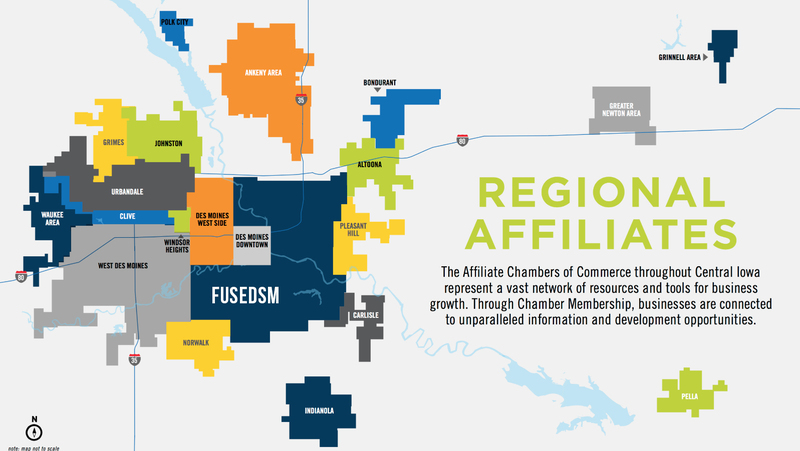 In January 2011, the East Des Moines Chamber and South Des Moines Chamber combined efforts and resources by offering joint membership. For the next two years, the Chambers worked together to provide enhanced benefits to members through goal-driven committees, programs to support member business needs and a full calendar of events. Following a recommendation from the East Des Moines Chamber and South Des Moines Chamber Boards of Directors in January 2013, members voted and approved to join organizations, forming one chamber: Des Moines East and South Chamber of Commerce. Merging to one chamber allowed the organizations to combine Boards of Directors and more efficiently and effectively meet the needs of its members. The combined Board of Directors developed a long-term strategy to ensure the Chamber positions itself to meet the needs of all it's members in East and South Des Moines. Five years later in 2017, another opportunity presented itself to grow our community of passionate and authentic business owners with the integration of the northside of Des Moines. We knew it would become a bit of a mouthful if we just added the north to our name so we rebranded ourselves to eliminate the borders that define most chambers. We did this so we could move forward into the future as one chamber ready to ignite business growth for everyone as FuseDSM, Your Chamber Of Commerce. Payment Policy: Non-refundable within 30 days of event.